Gifting at the solstice season is an old and honorable custom, stretching back into Pagan time, along with drinking and feasting. For those of us in the northern hemisphere, whatever our religious inclinations, the solstice season is a time for enjoying friends and kin, and sharing the bounty that the year has brought. Here at the always-annoying initial descent of winter I am already looking forward to Yule morning, when the light begins to grow again. Regular readers will know that I write books and sell them. I’ve done this a long time, though I have yet to have a main-stream publication. (The truth is I’m only a little motivated. The advantages of self-publishing continue to appeal to me. ) As a result I am sometimes asked how to approach my material in an orderly way, or, “what to read first”. In an effort to reduce the retyping of the answer to that question I’ll try to put the important stuff in order here. 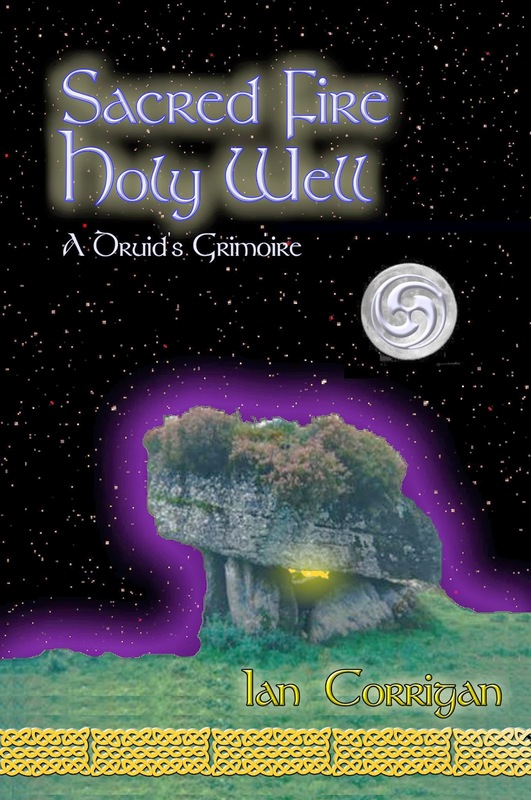 If you are looking to read my books, you are hoping to learn about a practical approach to modern Celtic-style religion and magic. I freely refer to what I do as Pagan, though my material is radically different from much of modern Pagan practice. I begin with a reconstructionist’s concern for the original and reliably authentic lore of the Celts, especially the Gaels. To that I add a modern mage’s willingness to reframe, reinvent and experiment. In general I am more concerned with occultism and sorcery than with religion, mainly just as my personal inclination. However all my magical work is framed inside the Pagan religious model in which I work. Blog readers will know my opinion about the intimate connection between religion and magic. Had I been interested in fame as an occultist, I’d have been an eclectic. Instead I have hitched my wagon to the specific ritual format and cosmology devised within ADF’s Druidry. Fortunately that format has come to be more in tune with trends (and/or contributed to them) in modern magic over the last decades. The modern interest in real work with spirits based on offering, divination and blessing fits very nicely (imhhaa opinion) with the work that I’ve devised. Readers used to working in a post-Wiccan or post-Masonic ritual style will find plenty in the material that can be adapted for their own work. 1: ADF’s Dedicant Path: The 150 page book that comes with one’s first year of ADF membership provides a simple introduction to the symbol system and ritual forms used in the rest of my work. I wrote most of the material, and edited the most recent edition. Even if one is uncertain about ADF as a primary Pagan path the material in our training, and the community of support, is valuable for those interested in non-Wiccan modern Pagan directions. The Dedicant materials are available only with a one-year ADF membership. Note that all the following are available at my Lulu shop, except for SFHW, which is available at Amazon from ADF Publishing. our Druidic system. The core material began as a pamphlet for our local Grove in 1991. By the end of the 90s it had grown into the 300 page item it is now. In truth, all the themes of my later work are present here. If there’s a fault in the book it is that the rites were written to be performed for and by medium to large groups. The seasonal rites are based on our local Grove rites, where we readily have a half-dozen voices available, and the magical rites are written for myself and a partner to work for a fairly large group. The rites have been criticized as unworkable by solitaries, and that may be true. However I continue to get good reviews from readers who find the book useful for developing a personal practice. It is a multi-category compendium with an introduction, at least, to the whole shootin’ - match. 3: The Book of Nine Moons. This is a formal system of weekly exercises intended to provide initiation in magical skills and alliances over nine months. It begins with a program of daily prayer and offering, and works its way into a fully consecrated home shrine and tools, practical magic and spellcraft and the work of gaining familiar spirits. It is specifically written for solitary performance. It includes no seasonal rites, focusing on personal hearth-cult and magical work. It is, according to students who have attempted it, an intense and challenging program. I based the model on the kind of work that we expected of ourselves back when I was running a training coven. It may be that the pace is too brisk for someone working the system at home alone. I do (still) plan on expanding it into a slower-paced set of trainings, but that has been slow to happen. Those who have completed some basic familiarization with Druidic ritual (say, the Dedicant’s work) will find more of the more advanced material in one place in this book than anywhere else. Having run a few students through the Nine Moons work I realized that much of the material might be of interest to folks not involved in Our Druidry. I decided that two of the primary teachings of the system ought to be broken out an offered to more general readers, apart from a rigorous general training. Those are the spirit-arte material, and the teachings on trace and vision-work. 4: The Book of Summoning. This book presents a systematic approach to gaining the aid and friendship of the spirits (especially non-deific spirits) and beginning to employ them in magic. It begins with a summary explanation of our Druidic ritual form, proceeds with a suite of rites intended to ‘introduce’ the magician to the spirits, and then proceeds to the work of making alliances. This book contains my final-to-date efforts to apply principles of classic magical spirit work as found in the grimoires to a polytheist, alliance-based model. The rites have been tested by several magicians now to good effect, and I’m confident offering the material. I expect the system to be especially useful for those working to gain primary familiar allies among the Dead and the Landwights. 5: The Book of Visions. Again using material lifted from the Nine Moons system, this book brings together the exercises for energy-work and vision-trance into a set of progressive exercises. This includes an invention of which I am fairly proud, the Nineteen Working. The working is a sit-down energy, meditation and visualization pattern based in a modern understanding of Celtic Pagan symbols. It offers both an opportunity for mystical insight, and an important level of understanding and authority for spirit work. The focus of the book’s vision-work is the construction and use of an Inner Nemeton – a visualized temple and workspace that serves as an arrival and departure point for further vision. This is presented in some detail, in a series of scripted trances. Also provided are exercises intended to allow an approach to the personal Higher Genius, here conceived in a Pagan way. Let me say this plainly – I don’t recommend buying both the Book of Nine Moons and the two “Books of…”. There is some new material in each of the latter (more in the Book of Summoning) but they mainly reframe material from the full system. The two later books are more modular, easier to adapt to a personal a la carte practice. The Book of Nine Moons is a complete system. goddess Brigid, meeting her primary ‘ministers’ or ‘angels’ or ‘daemons’ and working with the servant spirits of her ‘court’. It is based entirely on the methods presented in the Book of Summoning (and to some degree in Sacred Fire, Holy Well). It could be worked directly from the text by a new student, but some study of the underlying system will certainly reduce confusion. 7: Draiocht; A Celtic Sorcery Primer. As titled, this is a simple introduction to the system, along with a collection of deity invocations, spells and trances. If you want a walk-through of the kind of magic this is, this could be the book for you. 8: Beginning Practical Magic. This old monograph began life as a transcription of a day-long workshop on spellbinding and practical work. It remains chatty in tone, but it also still sells widely, especially in e-book. The advice and teaching has been rewritten in Sacred Fire, Holy Well. 9: Spirit Talk; Seedling of Pagan Theologies. Articles on Pagan theologies originally published on this blog. to synthesize my art. It is Wiccan in ritual form, but contains attempts at new work combining shamanistic methods with ritual magic. Very primitive by my current standards, but the art is fairly cool. 11: The Fire and Well Spellbook. This was me having fun with typesetting. It is all the ritual material from Sacred Fire, Holy Well arranged in a pretty type-face. Buy the hardback if you want something romantic for your wizard’s library. 12: Blank Books and Journals. (buggy-whips and sealing-wax on the left…). Keep an eye out, I put different ones up. Also see lots of them at my Tabula Rasa shop. 13: Liber Spirituum. The grimoire tradition of magic includes the idea of a Book of Spirits – a personal book in which one collects the names, sigils and ‘signatures’ of the spirits with whom one has made pacts. This is my typeset of one for myself. The decoration is Celtic, but it would work for any spirit-arte collection. The Dwale of Afagddu. My small effort at a Cthulhu Mythos tome begins with a weird tale of ancient Wales, telling the secret story behind Cerridwen’s brewing. It then provides a grimoires of mythos rites. It walks a line between actually performable and why bother, but it includes a variety of fake-evil sorcerous Cthulhu art by me. I write because I like writing, and because I hope that my words and ideas may be of value to other modern Pagans and occultists. I do my own typesetting and art, and enjoy making a book an expression of magic. May my readers be blessed by the work. I'm definitely interested in the Book of Summoning - I tried to come up with a Pagan-style evocation practice ages ago. I had a lot of difficulty because of context and having come from a Wiccan practice, which felt a bit lacking in the interaction department. Through ADF work I've found better ways of making friends and allies and I'd be happy to add to that practice. I'll have to order it when I have the cash!